* Added the function of displaying DVD chapters under the node of Rip DVD/CD. 1.Copy music, movies, videos and photos between iPad and Mac at superior fast speed. 2.Backup music, movies and videos from iPad to iTunes library. 3.Convert almost all video/audio formats (incl. M2TS, MTS, AVI, MPEG, WMV, DAT, TS, MPV, NSV, MOV, QT, H261, H264, WMA, AAC, AIF, AIFF, AC3, etc.) to iPad movies/music. 4.Rip CD/DVD to iPad music/videos. 5.All Apple portable devices are supported: iPad Wi-Fi, iPad Wi-Fi+3G, iPad 16GB, iPad 32GB, iPad 64GB, iPhone, iPhone 3G, iPhone 3GS, iPhone 4, iPod touch and other iPod models. 6.File transfer between iPad and Mac, DVD to iPad conversion and iPad video/music conversion will be finished at the least amount of time. 7.Recognize detailed information of iPad like type, capacity, version number, serial number and format automatically. 8.Easily create, edit, delete, manage or copy iPad playlists. Teach Macbeth with audio, visuals, text, maps, & data tracking! 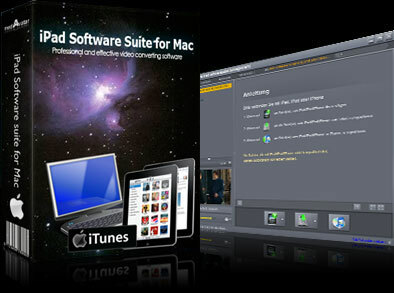 Qweas is providing links to mediAvatar iPad Software Suite for Mac 4.2.0.0602 as a courtesy, and makes no representations regarding mediAvatar iPad Software Suite for Mac or any other applications or any information related thereto. Any questions, complaints or claims regarding this application mediAvatar iPad Software Suite for Mac 4.2.0.0602 must be directed to the appropriate software vendor. You may click the publisher link of mediAvatar iPad Software Suite for Mac on the top of this page to get more details about the vendor.